The Dutch holiday season begins every November with the arrival of Sinterklaas (the Dutch version of Santa Claus). This bearded old guy arrives on a boat from Spain and hangs around the country for two weeks leaving small gifts in children’s shoes until the real celebration day (his alleged birthday) on December 5th when he leaves the big presents. After that, on December 6th he boards his boat back to Spain, making way for the rest of the celebrations, and just like in most other western countries the excitement continues to build to a frenzy culminating on December 31st. Part of the Dutch Sinterklaas tradition is baking with Speculaas. Speculaas is a mixture of pepper, cinnamon, ginger, cloves, cardamom and nutmeg and it is usually added to special nickel size cookies called Pepernoten (pepernuts) as well as larger size cookies, similar to gingerbread cookies which only appear during the Sinterklaas celebration. Speculaas has a wonderful smell and I can understand why any native would become very nostalgic for the magic of childhood just by walking down the street and smelling the aroma coming out of bakeries and supermarkets. This year I decided to break with tradition and do something else: not bake! Well at least not just yet! The idea of adding Speculaas to something creamy seemed really, really appealing, and combining it with chocolate magical. This cake is sublime and super easy! 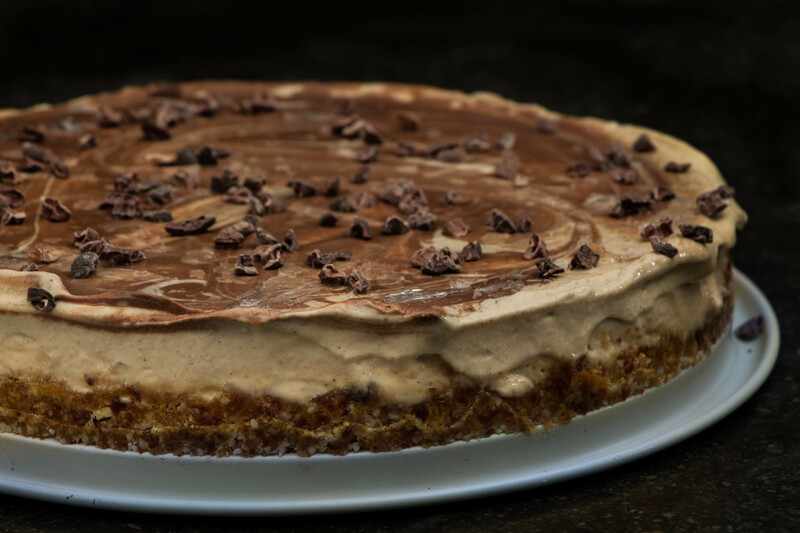 This Post was posted in desserts, nuts, snacks, Uncategorized and tagged cake, cashews, chocolate, holiday, nuts, raw, speculaas, swirl. Bookmark the permalink.